Beats’ first true wireless earbuds have class-leading battery life and impressive sound quality. If the second-generation AirPods didn’t excite you, Apple’s very own Beats is following them up with a bigger, longer-lasting, and more expensive pair of wireless earbuds that may be perfect for people looking for a better fit — particularly athletes. 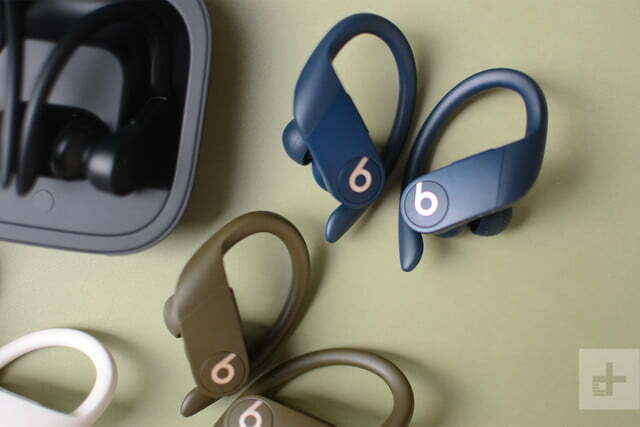 The Powerbeats Pro are the latest wireless headphones from Beats, and they’ve been re-engineered from the ground up, while still retaining the signature Beats style with the ear hook. The highlight? These are the brand’s first true wireless earbuds. The Powerbeats Pro look leaps and bounds more contemporary than their predecessor, the Powerbeats 3. Gone is the clip-like design that houses the main components; that’s replaced by housing that’s much thinner, and less obtrusive. I wouldn’t go so far as to say the Powerbeats Pro are subtle — I’d reserve that for a product like Samsung’s Galaxy Buds. Ear hooks don’t help, but while I don’t see myself donning the Powerbeats 3, I can see myself wearing the Powerbeats Pro. The clip looks a lot more elegant and doesn’t completely eclipse the ear. That’s largely because the Powerbeats Pro earbuds are smaller. 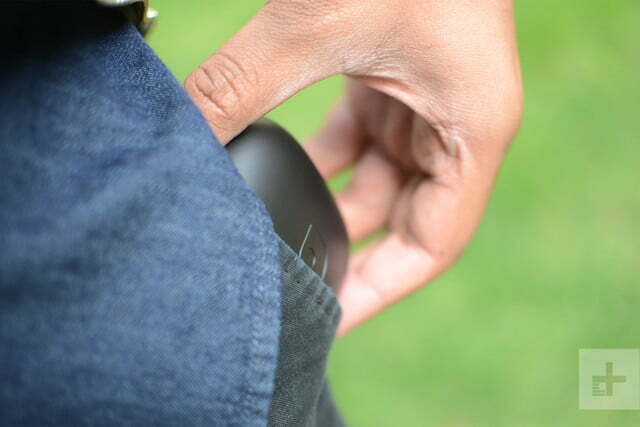 With a 17 percent reduction in weight, and 23 percent less internal volume, they’re much more efficiently designed. Best of all, of course, there’s no longer a clunky wire tethering each earbud together. Beats has finally stepped into the true wireless era. The Powerbeats Pro looks leaps and bounds more contemporary than its predecessor, the Powerbeats 3. 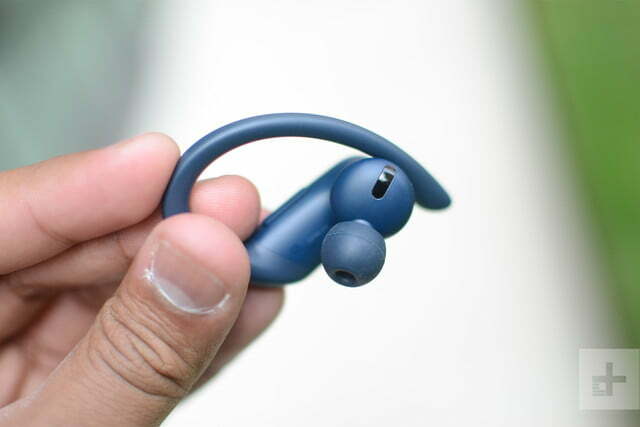 The acoustic housing in each earbud is slightly angled off an axis, and this, paired with the right-sized silicone tips, helps nestle the earbud for a snug fit. I didn’t feel any pressure in any of the sensitive areas of my ear — the earbuds felt lightweight and comfortable. I had a little more trouble with the ear hook, but that was largely due to inexperience wearing earbuds that had them. After taking the Powerbeats Pro on and off a few times, I quickly got the hang of placing them on the outside of my ear first before lodging in the silicone tips. The fit feels great, and there are four other silicone tips to choose from so you have some other options if the default tips are too big or small. While listening to music, the outside world is largely blocked off thanks to the tight fit, but I also tested the earbuds in a quiet hotel room for Apple’s press event — a true test will have to wait until we get a pair to take into the real world. 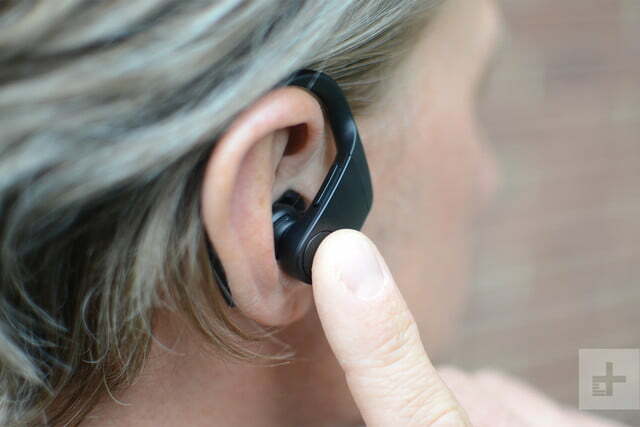 On each earbud there are two buttons: A volume rocker at the top edge, and a multi-function button (which has the Beats logo). As with the AirPods, the presence on both earbuds allows you to use whichever hand you want to control playback and volume. The multi-function button can also be used to handle calls, and you can press and hold it to talk to Siri. I didn’t make any intense movements with my limited time wearing the earbuds, but the earhooks should help keep the Powerbeats Pro in your ears. These earbuds are designed for athletes, after all, and that’s why they’re also sweat and water resistant. The company hasn’t revealed an official IPX rating, but Beats said you don’t have anything to worry about if you sweat profusely or use them in the rain — they just can’t be submerged in water. A major benefit of being owned by Apple, of course, is access to the company’s technology. The recently-released AirPods 2 are powered by Apple’s latest H1 processor, and the same chip sits inside the new Powerbeats Pro. 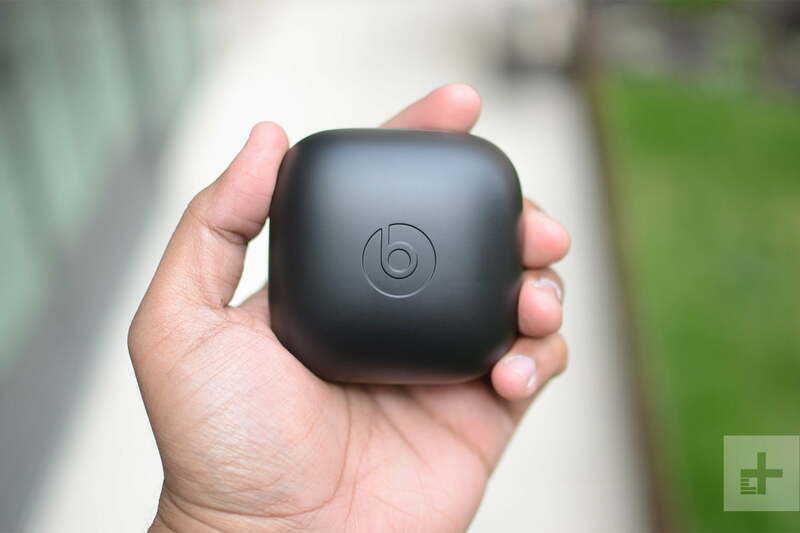 It’s an evolution of the W1 chip that’s in the original AirPods and other Beats products, and it offers a slight step up in connectivity and efficiency all around. The benefit of being owned by Apple means access to the company’s technology. Apple touted benefits for the new AirPods like 50 percent more talk time, the ability to activate Siri with just your voice, more stable connections, and more. Much of that is true with the Powerbeats Pro. You can just say, “Hey Siri,” instead of having to long-press the multi-function button. What I love most is that each earbud now individually connects to the source device. That means you can use just one earbud if you want (it doesn’t matter which). If you want to go for a run with one side, go ahead. Want to use one while the other is charging? Not a problem. It’s why there are physical controls on both earbuds — it offers far more versatility. The company also said there’s better call quality too. Inside the Powerbeats Pro is a speech-detecting accelerometer that identifies when the wearer’s jaw is moving through vibrations. Two beamforming microphones work in coordination with this sensor to filter out external noise and target the wearer’s voice. 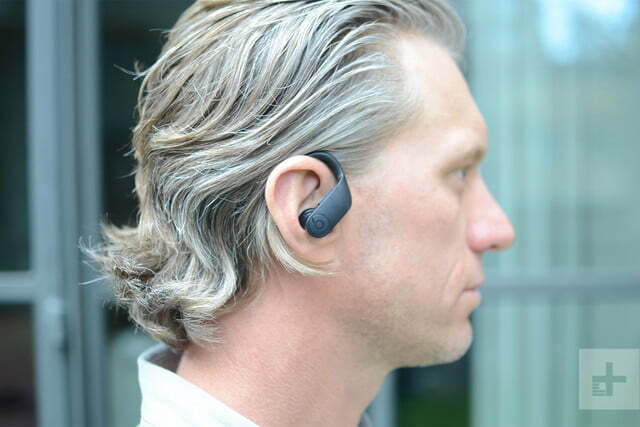 I didn’t get a chance to place a call in my time with the earbuds, but we’ll definitely be testing this. 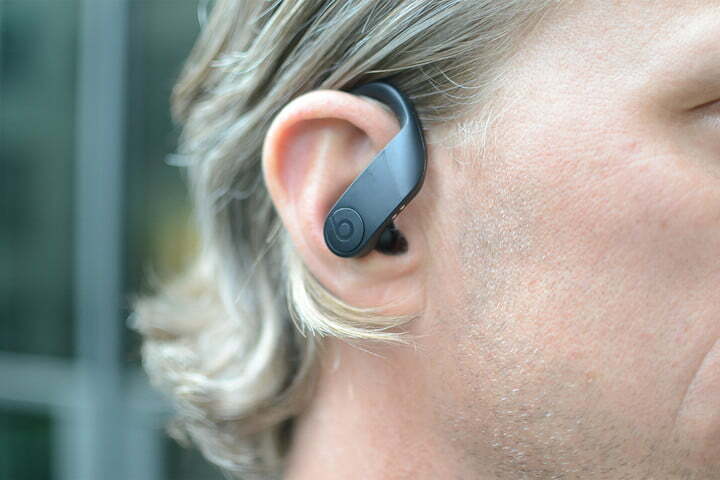 To round it off, there are long- and short-range optical sensors on the Powerbeats Pro that automatically play or pause music when the earbuds are placed in or removed from your ears and are paired to an iOS device. This also works with calls. So what do the Powerbeats Pro sound like? I only got a chance to listen to a few songs, so you’ll have to wait for the full review for a detailed breakdown, but I was most blown away by how the earbuds treated the low end. Bass in songs like Daft Punk’s Get Lucky is impressively clear. It’s easy to hear everything happening in the lower register, where things often get muddled. That’s in part due to a new piston driver, according to Beats, which is a break from the tympanic driver the company has used in all its previous products. The piston driver has a rigid, aluminum center that the company claims to offer a more powerful and consistent airflow. 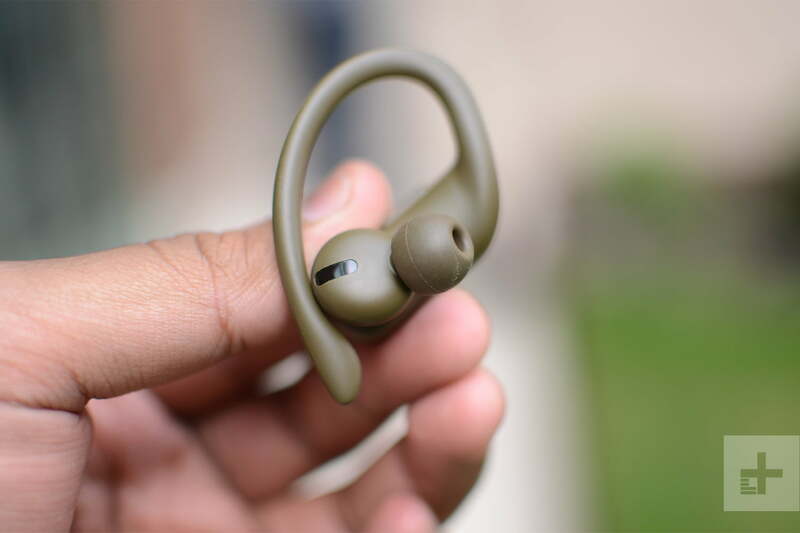 It can push more air through a smaller acoustic chamber, allowing for less distortion, and there’s also a venting chamber in the back of the earbuds to relieve pressure on the ear, which also helps balance bass. Bass was excellent, but it wasn’t overwhelming. 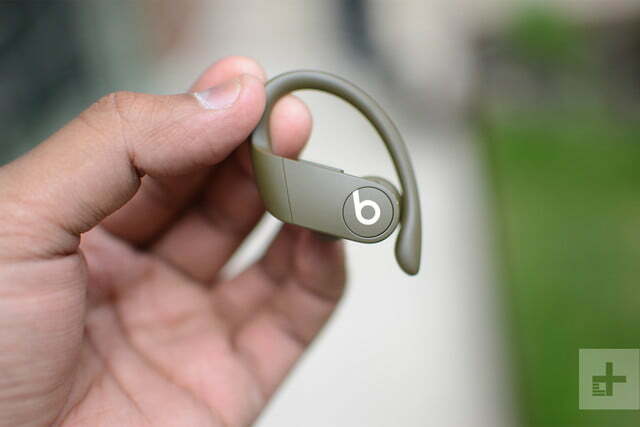 Music sounded well rounded on the Powerbeats Pro, and I’ll drive home the point of clarity. There’s enough oomph in the lows, but the rest of the frequency range was balanced, at least in my brief time with the earbuds. Like most true wireless earbuds, the Powerbeats Pro come in a case that adds more battery life. Unfortunately, the case here is comically large. Sure, it fit in my pocket, but I’m happy I wasn’t wearing jeans. 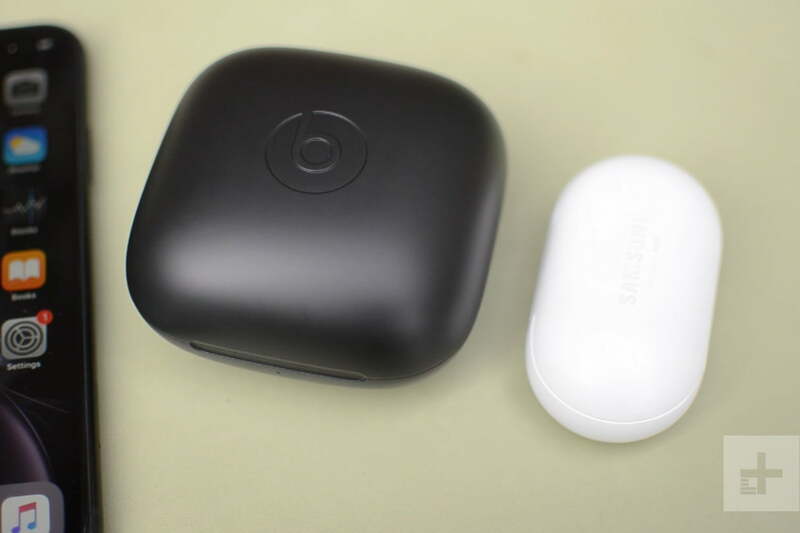 Here’s a photo of it compared with Samsung’s latest Galaxy Buds. You’re not going to want to put this in your pocket. It further drives home the target audience — people who are likely carrying a gym bag. I do wish there was a way to shave the size down a bit, but it wasn’t plausible if the ear hooks were to be a part of the design. While it’ll fit in some men’s pants pockets, most women will likely have to toss it in a handbag, or just leave the case at home. You’re not going to want to put this in your pocket. There’s a good reason to leave it home. Beats is claiming a class-leading battery life of nine hours of playback time per earbud on the Powerbeats Pro. In comparison, Apple’s AirPods 2 offer just five hours of playback time, which is itself better than the original Airpods. Having the case will get you more than 24 hours of battery life (it offers 2 full recharges), but chances are that’s not necessary day-to-day, and the earbuds alone should suffice. The case doesn’t charge wirelessly, unlike the new AirPods’ optional case. Instead, you’ll have to charge it with a Lightning cable, as it’s just a Lightning port on the back. It’s a shame it’s not a USB-C port, which is more universal outside of Apple’s ecosystem (and is also present on some Apple products too). Beats’ Fast Fuel charging technology returns, offering an hour and a half of playback with just 5 minutes of charging. A 15-minute charge will net you a claimed four and a half hours of playback. 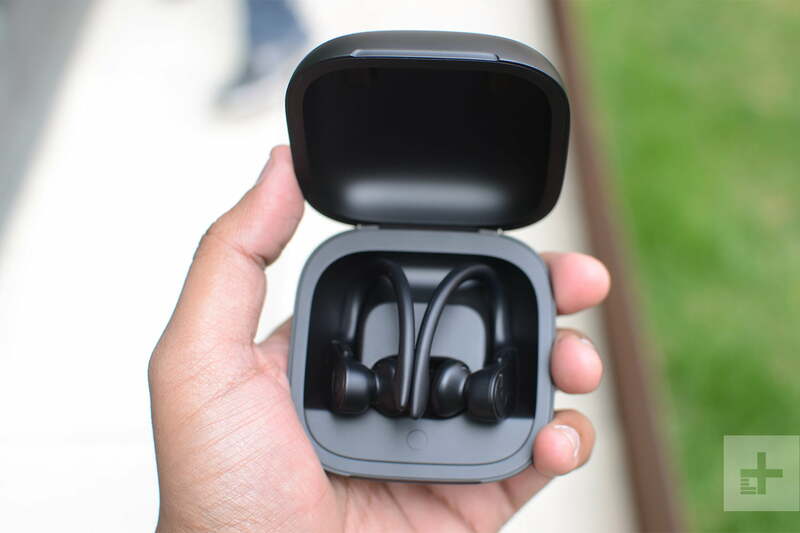 To help conserve battery life, the earbuds also have a motion accelerometer that will detect when they are placed on a table (or are just stationary and not in your ear) — this will then trigger a low power mode so you’re not losing juice. The case does have an LED light that indicates when battery is low, but if you have paired the Powerbeats Pro with an iPhone, open the case and you’ll automatically see a notification on the iPhone detailing battery life of the buds and the case. Sadly this, along with other features like “Hey, Siri” does not work when the Powerbeats Pro are connected to an Android phone. 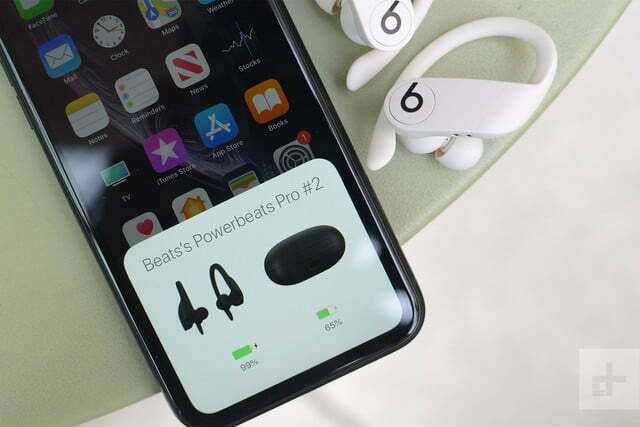 You will pay more for headphones with such long battery life and the addition of water resistance when compared to the AirPods: The Beats Powerbeats Pro will retail for $250. That’s a $50 bump from their predecessor, and for comparison’s sake, the second-gen AirPods with the wireless charging case costs $200. 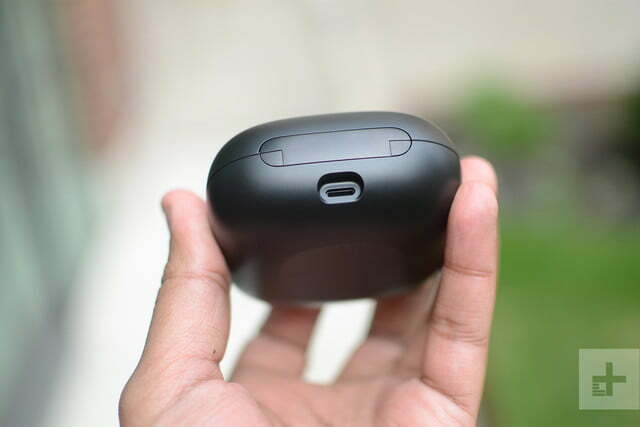 If anything, the audio quality and battery life alone make the bump in price seem worth it, but you’ll have to decide whether the ear hook design and fit is right for you. You can get them in black, ivory, moss, or navy colors, and they will be available sometime in May. In my brief time with the Powerbeats Pro they seem to be a compelling new option. Still, more testing will give us a stronger opinion on these buds, so stay tuned.